Ever wondered what's going on inside your head? You are your brain. Everything that makes you you, and all your experiences of the world, are somehow conjured up by 1.4 kilograms of grey matter inside your skull. That might seem impossible, but science has advanced so much that we now understand not just its structures and inner workings but also how it can give rise to perception, consciousness, emotions, memories, intelligence, sleep and more. 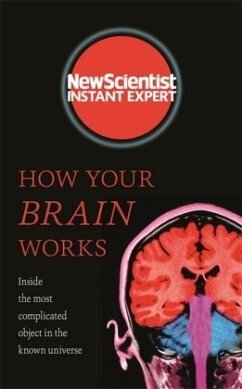 HOW YOUR BRAIN WORKS explores the amazing world inside your head. Discover the evolution and anatomy of the brain. Learn how we can peer inside it and watch it at work, and how the latest technology can allow us to control our minds and those of others. ABOUT THE SERIES New Scientist Instant Expert books are definitive and accessible entry points to the most important subjects in science; subjects that challenge, attract debate, invite controversy and engage the most enquiring minds. Designed for curious readers who want to know how things work and why, the Instant Expert series explores the topics that really matter and their impact on individuals, society, and the planet, translating the scientific complexities around us into language that's open to everyone, and putting new ideas and discoveries into perspective and context. Since the first magazine was published in 1956, New Scientist has established a world-beating reputation for exploring and uncovering the latest developments and discoveries in science and teCNology, placing them in context and exploring what they mean for the future. Each week through a variety of different channels, including print, online, social media and more, New Scientist reaches over four million highly engaged readers - over a million readers for the print magazine alone.